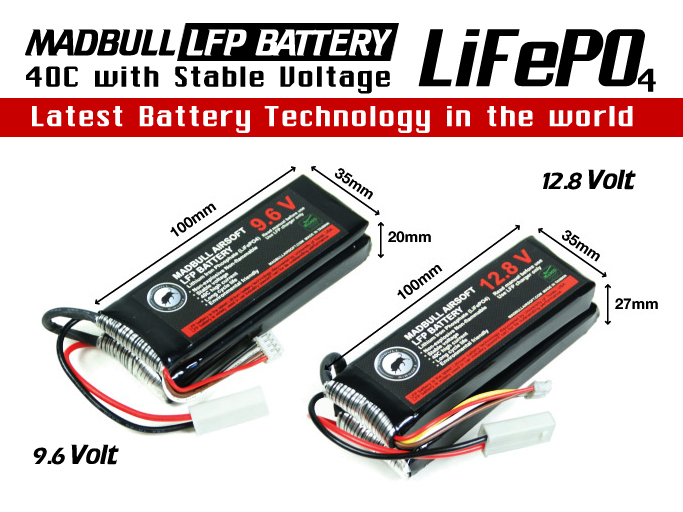 Today we received the Madbull Airsoft new LifePo 12.8V battery together with the Madbull Airsoft LFP charger. This is the latest of battery technology for airsoft. I never expected to use LiFe batteries so soon. There were poor sales of the Li-Poly batteries and a lot of doubt regarding safety (we all know those explosive YouTube movies). 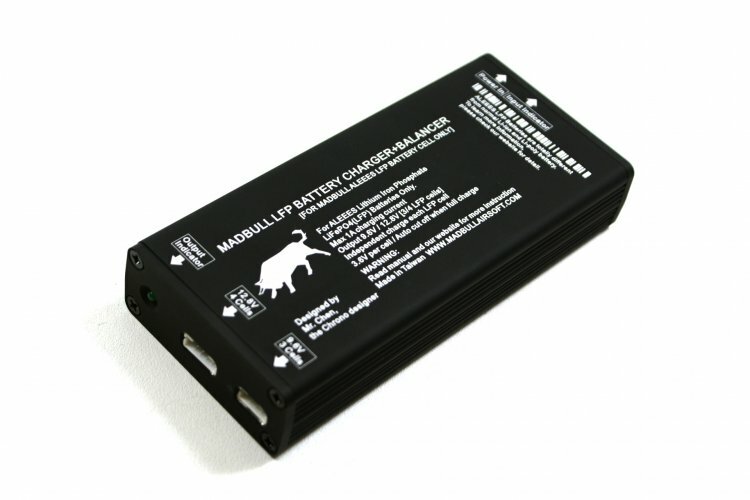 However this type of battery is taken into serious production by MadBull Airsoft! They introduce their own development of this promising battery in the form of a 9.6V and 12.8V LiFePO4 battery together with a charger. They last longer, are safer, and easier to handle as compared to Li-Poly batteries. 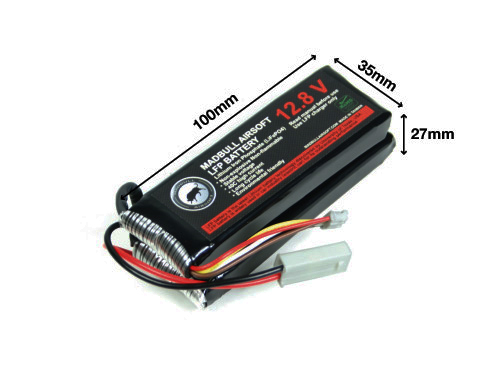 This 12.8v LiFEPO4 battery can deliver even more power than a 13.2v Ni-MH large type battery with only half of the size and a third of the battery cells. LiFePO4 batteries are designed to give the same performance as a LiPo but with a higher tolerance for abuse it is much safer to use. So we requested a review sample and headed for testing. Are we seriously considering these revolutionary batteries for our expensive AEG's? In 1989, Arumugam Manthiram and John Goodenough of the University of Texas at Austin showed that cathodes containing polyanions, eg. sulfates, produce higher voltage than oxides due to the inductive effect of the polyanion. In 1996 Goodenough and co-workers discovered the electrochemical utility of the olivine material lithium iron phosphate, LiFePO4. It is an important and emerging cathode material for lithium-ion batteries due in part to its enhanced safety compared to other lithium-ion chemistries. Lithium iron phosphate ( LiFePO4, also known as LFP), is used as cathode material for lithium-ion batteries. Its characteristic does not include noble elements such as cobalt, the price of raw material is lower and both phosphorus and iron are abundant on Earth which lowers raw material availability issues. Avoiding the lithium cobalt oxide cathode leads to a number of advantages. LiCoO2 is one of the more expensive components of traditional li-ion batteries, giving LFP batteries the potential to ultimately become significantly cheaper to produce. LiCoO2 is also toxic, while lithium iron phosphate is not. LiCoO2 also can lead to problems with runaway overheating and outgassing, making batteries that use it more susceptible to fire than LFP batteries. This advantage means that LFP batteries don't need as intense charge monitoring as traditional li-ion. Lastly, LFP batteries tend to have superior power density in comparison to traditional li-ion. Madbull gives all of us an exclusive view in their battery kitchen, check this YouTube video below to see how these batteries are made. Build quality is extrmely well done. Most impressive is the charger which is also made by Mr. Chen (the designer of the Madbull Chrono) and he used rock solid 6061T6Aircraft aluminum which is extremely durable. The charger is simple to use, has clear indicator lights and is usable for both the 9.6 and the 12.8V version. The battery comes in a nicely protected package (full of safety warnings, we will come to that later) and the housing seems to be decend. It has to be noted that the battery comes with a mini Tamiya connector. No worries about all the wirings, this is how it has to be done. Improtant to note is that the batteries DO NOT come with a high throughput Deans connector. True, most type AEG's are standard equiped with a mini or large type Tamiya connector. However operating at higher current levels and larger throughput, Deans connectors are the connectors to use. I really would like to see these batteries with a standard Deans connector and i will be more than happy to modify my AEG and implement a Deans connector. 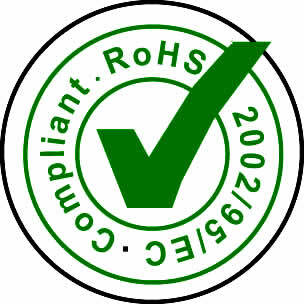 Just good to know and only worth a short notice is that these batteries are RoHS Compliant.RoHS stands for 'Restriction of the use of Certain Hazardous Substances in Electrical and Electronic Equipment'. For those who don't know, this is a market directive introduced in 2006 by the European Union to restrict the use of 6 hazardous materials in the manufacture of various types of electronic and electrical equipment. The hazardous materials include Lead (Pb), Mercury (Hg), Cadmium (Cd), Hexavalent chromium (Cr6+), Polybrominated biphenyls (PBB), Polybrominated diphenyl ether (PBDE).So Madbull takes their environmental responsibility here. Off course this is a chart from the manufacturers themselves, however I think the values stated are true and show a fair comparison between the current battery technologies. 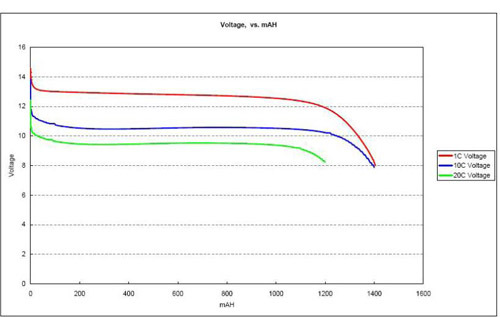 Most noticeable is that the LFP batteries are relative cheap compared to NiMH batteries. They only perform average on MAh/Peice and Vol/MAH, rest of the items are covered by the LFP battery. (1) A new battery comes in a discharged condition and must be charged before use (refer to the device manual for charging instructions). (3) Similar to NiCd and NiMH batteries, lithium-polymer batteries can release extremely high voltages. (4) Always use battery manufacture approved chargers to recharge the batteries. (5) Always empty the chamber of your AEG, remove the magazine, put on barrel cap and put on safety before you change the battery. (6) Never place the battery near the heater, fire, or any heat sources. Never throw the battery into the water or keep the batteries in a damp environment. (7) Never allow a battery’s positive and negative leads to accidentally touch each other. (8) Never connect the battery to the wall plug or cigarette lighter plug in vehicles. (9) Never dispose batteries with fire or warm up the battery using any heat sources. (10) To avoid short-circuit, all batteries should be stored or shipped free of any conductive materials, including necklace, hairpin or any metals. (11) Never hit or throw the battery against any walls, floors or hard subjects which may damage the batteries by violent mechanical vibration. (12) Never use hammer, nail or any sharp object to pierce or penetrate through the battery insulator. (13) Never solder the battery’s connectors with wires. (14) Never disassemble the batteries in any means. (15) Never charge the battery in an extreme hot environment. (16) Never place the battery in a microwave or pressurized container. (17) Never use the lithium-polymer batteries with the disposable batteries or rechargeable batteries in different types, capacity or brands. (18) Before and after every use of your lithium-polymer batteries, inspect all cells in the pack as much as possible to ensure no physical damages, discolor, heat emission, or swelling in evident. Such signs can often indicate that a dangerous problem exists and the batteries should be disconnected and disposed immediately. (19) Always store the lithium-polymer batteries in a secure location away from children. If a child accidentally ingests the battery, the child should receive medical attention immediately. (20) Remove or dispose the batteries immediately when batteries are leaking watery substance and emit strange order. (21) Do not allow the battery’s electrolyte to get in the eyes or skin. Wash affected areas with soap and water immediately if they come in contact with the electrolyte. If electrolyte makes contact with the eyes, flush with large amounts of water for 15 minutes and seek medical attention immediately. (22) To prolong battery life-span and to ensure battery full function, charged battery should rest for at least one hour before discharging. (23) Never keep the batteries in an extreme environment, such as direct under sun light or inside the car during hot summer. Otherwise, batteries will overheat or even ignited to substantially shorten the lifespan and damage the function of the batteries. *Nominal capacity (average discharge capacity) : discharge current 0.5C, end of voltage 2.0V, temperature 23±2℃. **Nominal voltage (average discharge voltage): discharge current 0.5C, end of voltage 2.0 V, temperature 23±2℃. For Lithium Iron Phosphate LiFePO4(LFP) Batteries Only. Output 9.6V (3 LFP cells)/ 12.8V (4 LFP cells). Independent charge each LFP cell. 3.6V per cell / Auto cut off when full charge. A very decend pricing for the quality you get. There are also battery/charget combo packages with a little discount. For now we will first consider which AEG to use for this heavy lifting, we will soon come back to you with our results. Off course we will use the madbull chrono to check the fire rate (bals per secong, bps). The video below shows the battery can cause an impressive 27 bps! Lithium iron phosphate (molecular formula is LiFePO4, also known as LFP), is used as cathode material for lithium-ion batteries (also called lithium iron phosphate battery). Its characteristic does not include noble elements such as cobalt, the price of raw material is lower and both phosphorus and iron are abundant on Earth which lowers raw material availability issues. Introduction This landmine is the first mass produced Airsoft landmine and is finally availeble for scenario gaming or just for fun! Add variety to your war game experience with this gas powered land mine that detonates when your enemy steps on it. Shower them with baby powde or use as a distraction device. This mine includes a loud pop when detonated! People will scare to death! I just received these unique thing in and I'm really impressed! Looks are cool and opperating is really fun! The design is simple and save and works very practical and fast. Even a safety ring is included. What kinda disappointed me was the size of it. More on this later. This landmine will deliver best performance with CO2 gas, which gives off a VERY loud "POP" sound when stepped on. Green gas or red gas can be used as well. HFC134a gas will work but will be quite weak. Gas charging is as easy as filling any GBB or grenade shell. Baby powder loading is also very simple - just remove the upper cover and put the powder on the dish. When you are ready and the mine is in position, unscrew the safety ring, put the upper cover back and hide it with leaves or straws! Resetting the mine is very easy and is done very fast. Using some chalk or flour will add a nice smoke effect. The smoke effect is not big but adds a nice effect. We used during this test movie HFC green gas. We expect that propane makes a decent louder pop and sprays out the flour a bit better. Madbull recommends a maximum pressure of 500psi in their landmine, you will than certainly be rewarded with a very sharp bang. You can also put 8mm BBs or paintballs over the holes so that they fly upward when the mine is detonated, this is adviced not to do for optimal performance. Madbull has deliberately chosen not to make this landmine use 6mm BBs for safety reasons since the BB's would fly upwards and possibly through the games in players' safety glasses. Individually serial-numbered for easy identification in case someone tries to steal your landmine and make it theirs!?? There is one part of the mine I found annoying though. The black plastic "safety ring". It can be pressed onto the trigger plate rather firmly. Be sure to install it properly otherwise you will need tools to remove this ring. This is really funb in the field. It really adds a nice dimension to airsoft and you can really scare people to death :) We experienced 2 rather small things to discuss. First we expect that the fill valve may get clogged with mud or dirt, best way to solve this is to put some duck tape or something down there to prevent some filling problems in the future. Maybe mdbull should improve this with some sort of cap. Second the magbull landmine is rather small. On the pictures the mine looks pretty big. However when you compare it with a computer mouse it is almost the same in size. This is not a large "teller mine" and you will definately need some mines to make this approach effective. At least 5 I would say and that will become very costly. The MadBull TALON system is a licensed product by Gemtech. Originally the Talon Trinity system is a 9mm conversion for the AR-15 series, build in the upper receiver. The Trinity System made by Madbull features a barrel extension module with interchangeable rails for use with many different Airsoft replica AR-15’s from TM to CA to ICS. The Madbull Talon is a welcome addition to all the standard 4-sided RIS RAS rail systems for the AR15 replicas. Its rail setup versatility is it’s foremost feature to me. Out of the box the unit looks impressive with all its supplied rails and millions of screws. Even if you fill all the hole’s you will still have enough screws left to build a house, anyway back on subject. Also the supplied outer barrel and silencer look and feel rigid. The Product looks good, time to take a closer look. Installing the Talon is easy, except for the slip ring disassembly, this part of the installation is a hard nut to crack without using some brute force. But past this point the Talon installs with ease. 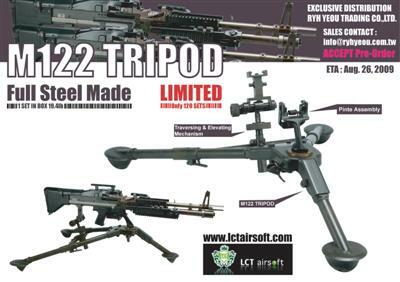 If you want to use the supplied silencer then the outer barrel assembly is much easier. But you will have a problem with the length of the original inner barrel. You have 2 choices, cut the original inner barrel to the correct length or buy an extra inner barrel with the correct length. I would choose the last option if I have to. I would only use this setup in CQB terrain, not in woodland. Due to the short length of the inner barrel you would have an imprecise trajectory. Choosing the setup you want for the many rails supplied is easily done and within a few minutes you changed the look of your front-end. Just by using u hex screwdriver. Unfortunately I could not find a hex key supplied with the kit, this could be accidental. Luckily I’m well supplied with various tools. Madbull made the front-end out of two pieces of thick machined aluminum. All parts have great fitment with each other, everything aligns correctly. I have the feeling that you could run a big 4x4 over the Talon front-end and it would still have its shape.. Sorry didn’t test it. Silencer and barrel assembly are also perfect, the silencer has 2 parts, screw them together and the seem almost disappears. Main Irish Airsoft, Ireland's First and Largest dedicated online and walk in Airsoft retail store.